Photo courtesy Georgia State Senate. Yesterday afternoon, a group of 15 people, most reportedly associated with Black Lives Matter, was arrested in the Georgia state capital for demanding that every absentee and provisional vote be counted in determining the gubernatorial winner in last Tuesday’s midterms. Among those arrested was State Sen. Nikema Williams (D-Atlanta), who said she was quietly standing in support of the group of around 100 in the public rotunda. The arrest, by the way, is expressly prohibited in Georgia, in that legislators “shall be free from arrest during sessions of the General Assembly” except in cases of treason, felony, or breach of the peace. 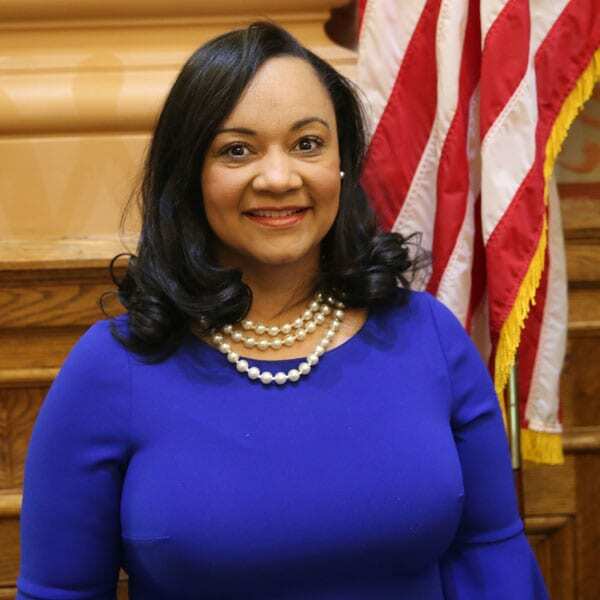 Williams was arrested for obstruction, while the 14 others who were detained were charged with disrupting the General Assembly. Meanwhile, although the secretary of state’s office had planned to certify the vote yesterday, a federal judge ordered that it could not do so before Friday and that it had to “immediately establish and publicize on its website a secure and free-access hotline or website for provisional ballot voters to access to determine whether their provisional ballots were counted and, if not, the reason why.” Other suits are in the process of being brought for the state’s rejection of votes for minor infractions as Stacey Abrams’ campaign, in league with voting rights advocates, attempts to force a run-off against Brian Kemp, the secretary of state and her opponent in the race for governor. A federal judge calls Florida’s voting infrastructure a “laughingstock” while candidates and voters and the courts spar over what constitutes an end-point.